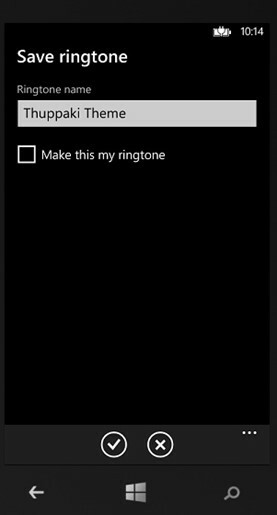 How to save ringtone in Windows Phone using SaveRingtoneTask? How to Search for Music in the Windows Phone Marketplace using MarketplaceSearchTask? Sometimes , it is might be possible where the user might like a specific audio in an app and wish to save the audio as ringtone provided the audio file meets the ringtone criteria like the type of the file , size of the file and the DRM protection. The developers can utilize the chooser SaveRingtoneTask to allow the users to save the audio file as ringtone. Just create an instance of the SaveRingtoneTask and set the file name from the app that you wish to save as ringtone . The user will later save the ringtone and can set it as ringtone to different contacts from the People’s hub.